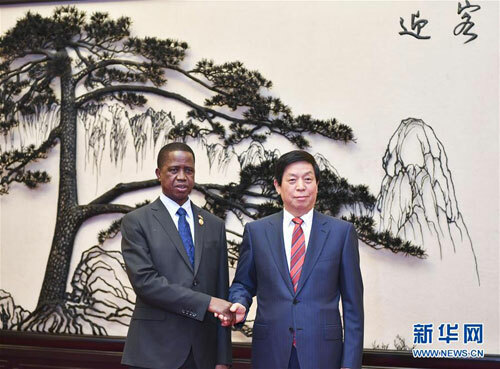 BEIJING, Sept. 1, China's top legislator Li Zhanshu on Saturday met with Zambian President Edgar Lungu ahead of the 2018 Beijing Summit of the Forum on China-Africa Cooperation. Li, chairman of the National People's Congress (NPC) Standing Committee, said the NPC is ready to enhance the exchange and cooperation with the National Assembly of Zambia to provide a legal guarantee on the implementation of the consensus reached between the leaders of the two countries and the outcomes of the upcoming summit. Lungu said Zambia will do its best to consolidate the traditional friendship between the two countries and further strengthen the pragmatic cooperation in various areas to elevate bilateral relations to a new level.